Well as you are here reading this, there are two chances, as this page (HTML Colors Codes Chart for Web Developers by GeekUpd8) is among the top results that users see on Google Search result page for keywords like "HTML Color Codes" chances are you don't know much about these hexadecimal color codes system and you were looking for code of some color and reached here. Another thing that is possible is that you are a web developer and were looking for some exceptional color code that is mostly not used and is quite rare, as you can see the list of quite long and that long list of colors indexed in google, brought you here. 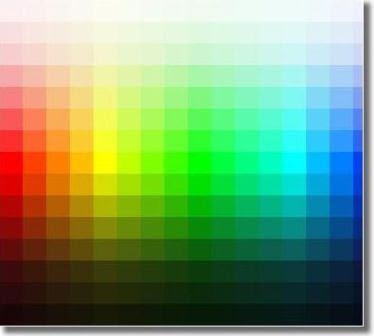 Now that you are here, it would be good idea to make you aware of these color codes in case your reason of being here is the first one. HTML Color codes are basically nothing but combination of letters and characters. Each of these codes contain the "#" symbol prefixed to it. After the # symbol, the remaining part of the codes is written , which could be anything like FFF111 or FFFFFF or 000000, that it could be partly characters and partly numerics, or it could be all characters and it could be even all numerics. Now lets have a look at how this code actually is formed. The initial two symbols of the code represent the intensity of the RED Color. 00 is the least and FF is the highest intensity. The next two symbols used in a color code represent the intensity of the Green Color and the last two letters represent the intensity of the blue color. And thus with these color codes and with a variation of the color codes, we can make any color that looks appealing. #00FF00 - This HTML code shows just green and no red and blue. #CCEEFF - Take some red a bit more of green and maximum of blue to get color of sky.